Going into my senior year of college (wow typing that out made me feel old! ), I feel like I've nailed how to get all my textbooks without spending a fortune. I remember back in freshman year naive little me bought every single book on my syllabus at the student bookstore and didn't think that there was really any other way to go about things. I've learned that although the bookstore is convenient, it is also probably the worst way to get your books as the prices are more than likely inflated than what you would find online. I decided to give you all the scoop on how I do things now after a few semesters of trial and error with buying books! I know a professor who assigns books and then never mentions them in class. They aren't used on tests, essays, etc. Everything is based off of lecture. I'm convinced he only assigns the books because the school makes him. This is difficult to do if you're a first semester freshman, but if you've had a professor who never touches the assigned reading material, skip buying it. Again, the best tip here is having the professor for a previous class or asking a friend if the text is really necessary for a certain class. Not all books are necessary, so don't go wasting $50 on a textbook that will sit on your desk all semester gathering dust. I only bought four books last semester. Five classes, each had at least two textbooks assigned (my thesis had eight by itself!) and I only had to buy four? That's thanks to my good friend Google Books. For the last year I've gotten my list of required texts together and typed each one into google and added "google books" to the search. Sometimes there are multiple links for the same book that pop up but you want the one that says "Preview this book." I've been lucky in the past where 75% if not all of the book was available for preview with my required book. I personally don't mind if a small amount of pages are missing from the preview, but if that's something you need just make sure all the pages are in the preview. I always double check my syllabus to see if it says exactly what the book will be used for in the class. If there's a chapter by chapter summary due every week, get the book. If you have to write an essay based on the book, you should be fine with the 75% content preview. Again, this is just my personal opinion! In my cheapness, I've tried many things to get out of spending $75 for a 100 page book. One of these things is googling "Textbook Name Online PDF" sometimes this works, sometimes it doesn't. This is very helpful if I only need a specific chapter of a book that was assigned and don't want to waste money buying the whole book! Another way to find pdf versions of your textbook is searching in your library's online catalog. Sometimes you can find the whole book online for free! Like the tip before, be sure to search through your school library's online catalog and double check that your required texts aren't available online for free. Even if they aren't, the library should have at least one copy of the necessary textbook available to rent out. There may only be a limited amount though, so be sure to get there as early as possible to grab that book! You can re-checkout the book throughout the semester, so no need to spend any money. I was lucky that I took a class that my roommate had taken during a previous semester. She decided she wanted to keep the book for the class and allowed me to use it when I took it this semester. Ask around and see if your friends have taken your class and are still holding onto the textbook. They might let you borrow it if you ask nicely. Can't get your book for free? Here are your next best options. Amazon and Barnes and Noble have this option for a good amount of their inventory. You buy the book via Kindle option and essentially it shows up like a digital copy on your laptop. I don't own a kindle, so when I discovered this option I was a little concerned that it wasn't going to work for me, but it did! The prices for the Kindle version are much more discounted than buying the actual physical books, no you can't exactly take notes like a normal book, although the kindle book system does let you highlight passages you want in multiple colors! Are you and a friend taking the same class? Why not share the book that you need to buy and save half the cost! You can decide to split readings by chapter and create a google doc for notes, take turns keeping the book at home, or one of you can photocopy what you need. Either way, it's a good way to save half of your cash. Whether it be from your school's bookstore or a website like Amazon or Chegg, you can decide to rent instead of buy your book. You just have to remind yourself that your book is due at the end of the semester (or whenever the date may be). It's not the cheapest option out there, but it is cheaper than outright buying the book. 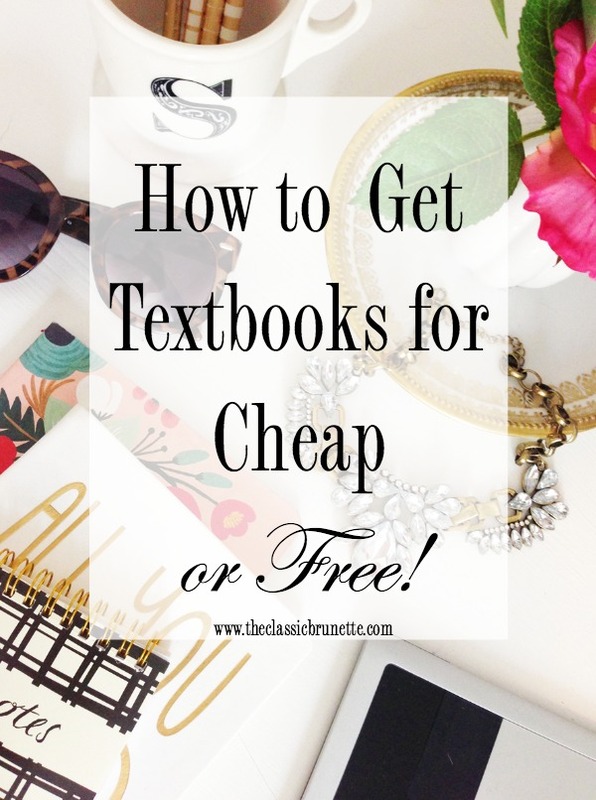 If you have to buy your textbook go for these cheaper options first! Always go for the used textbooks instead of new books! Guaranteed they'll be at least a few dollars cheaper. Also, if you haven't signed up for Amazon Student, you're missing out! Another good place to search for textbooks is on ebay or craigslist. People are constantly selling big name textbooks on these two sights, so keep your eyes open! I'm not sure if every school has one of these, but I do know of a few schools at least that have a Facebook page where students buy and sell various things. If you aren't sure if your school has one of these pages, just type it in your Facebook search bar, that's how I found mine! You can either wait for someone to post about the book you need, or make a post yourself with a list of books and ask if anyone is selling. I know it's a little early for this post, but it's better to know these things ahead of time than after spending hundreds on textbooks. Happy purchasing! Amazon student is amazing lol. It is! I didn't want to pay for it though, so I did the 6 months free then stopped it! Okay I'm definitely coming back to this when I go off to grad school this fall! I hope this post helps you when the time comes! I love using Kindle books. Always so nice! Same! It's such a great alternative to physically buying a book! Plus so much cheaper! So helpful! I wish I knew all of this when I was buying college textbooks! These are great tips! I always loved getting a deal on my books! I just graduated and have to say though that I'm quite excited to not have to buy books this fall! So glad to see more options for getting textbooks. When I was in college a little over five years ago we really only had to buy it new/used or to rent it! It's so interesting to see how far the textbook buying world has come! I love this - and wish I had seen it/had it before I graduated haha! ; ) Finding PDF's or borrowing from the library were my favorite options - sometimes I didn't even buy the books lol!!! Sometimes I don't buy books either! Some teachers literally don't use the books they assign at all! There are SO many great tips in this post! I refuse to spend more than $150 on textbooks for a semester. If that means I have to share a book with a friend, so be it! It's not worth wasting money on books, especially if you know you won't use them often! Thank you so much! I completely agree, I like that you have a cutoff limit. If you do some research it's definitely possible to save so much money on textbooks! Love these tips! They will be so helpful for college age! Awesome ideas! Textbooks are seriously one of the worst parts of college because they are so expensive. Thanks! I know they really drain your wallet! Great post, thanks for sharing girl! Luckily my school had a rental program that saved me TONS of money. But love this post idea! Thank you! That sounds like a great program! We can rent, but most of the time the price difference wasn't that much unfortunately! I always bought my books, used if they were in good quality. I loved having an actual textbook. I could never share because I was a procrastinator :) and never knew when the mood to do the homework would strike. These are great tips though!! Amazon is amazing for getting cheap textbooks! It definitely has saved me more than once! Great tips! I rented and bought this past semester, and I still have one book to return as of today. Not sure if I wanna rent again, so I'll save this post and try some of what you've said! Thank you! Thanks so much! Hope it helps! Such great tips!! My school had a rental system, but this would have been a great resource for me had they not. These are such great tips! When I was in college, I always waited until the last minute to buy books just to make sure we were actually going to use them in class. Thanks! I do that too sometimes, I don't want to get a book if I'm not going to need it! I can't stand not having a physical book in front of me, so I always rent or buy my books. But I always use SlugBooks because it finds the cheapest listings online! This semester my 5 books will only cost me about $50. Um yes please! I made the same mistake by buying textbooks at the school store. I have done Amazon ever since and just sell them back to the school bookstore at Finals time.